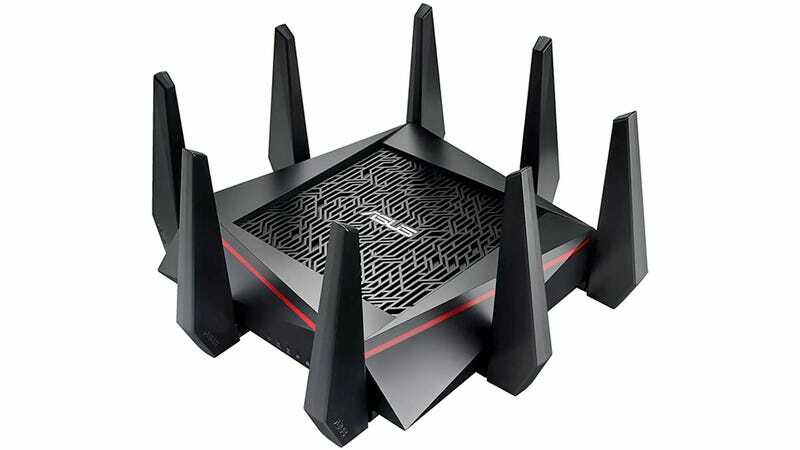 At its IFA presser this morning, Asus claimed that its new RT-AC5300 router provides the world’s fastest wi-fi. That’s a bold claim, but at the very least, this thing looks like serious business. It looks like a crazy death spike or a science fiction space habitat. The RT-AC5300 is a tri-band router that operates on 2.4 GHz and dual 5 GHz frequencies. It’s capable of speeds of up to a 1Gbps on the 2.4 GHz band and 2.167 Gbps on each 5 GHz band for a total (potential) potency of 5.3 Gbps. Haha, yeah right. The router looks crazy because it has, count ‘um, eight removable antennas. And if you don’t want to scare the hell out of your dinner guests, I recommend you pull a few off, lest they think you’ve got a bomb in your living room or something.